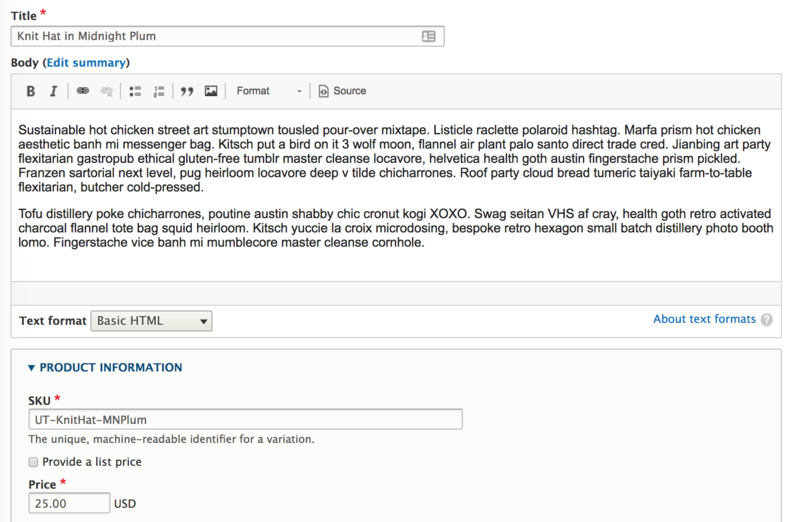 What's new in the Commerce 2.10 release? To achieve this same result in Drupal 8, we've rebuilt this API and added it to the recent 8.x-1.0-rc1 release of the Entity API module. Commerce is now using it for administrative listings of products, orders, and stores. The API adds a QueryAccessEvent to allow modules to alter the access conditions, making it possible to apply further filtering (e.g. only show the user’s own store). Next we will extend the filtering to Search API to filter customer facing listings. May was one of our most productive months to date. It was full of releases for the core Commerce modules, our standalone PHP libraries, and essential contributed modules that all work together to comprise Drupal Commerce. While I outlined the highlights in the roadmap issue on drupal.org, these wins are worth sharing more broadly to keep the rest of the Drupal community in the loop. The biggest release of the month was Drupal Commerce 2.7, which included new features for currency formatting, address form configuration, and stored payment methods. It also fixed a handful of bugs that unblocked other module releases and updated core in response to improvements in our libraries and dependent modules. We've long discussed how our standalone PHP libraries are exporting expertise off the Drupal island. Addressing and Internationalization, which have each been downloaded over one million times, are our two shining stars. We rolled new releases for each of them in May, improving even further Drupal Commerce's ability to solve the hardest parts of address entry / validation / formatting and currency localization. Refer to the price formatting change record from the 2.7 release to see how the new API is more flexible and performant as a result. Additionally, we released Address 1.4 and Inline Entity Form 1.0 RC1. The latest Address release unlocks the customer profile’s address field to support collecting less detailed billing addresses. 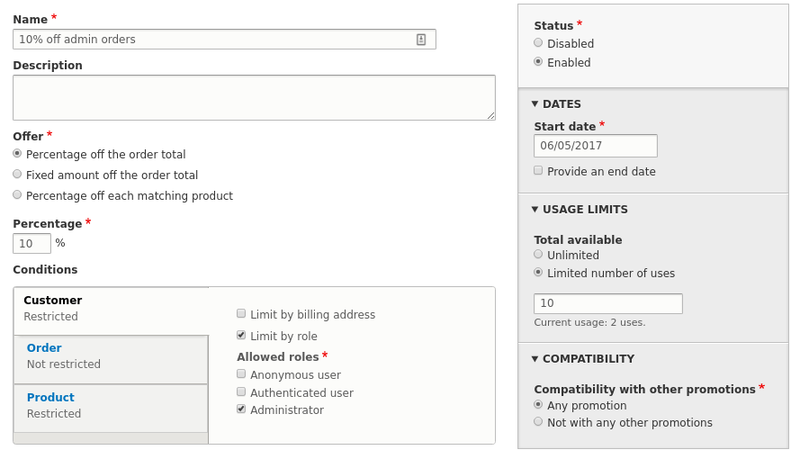 The Inline Entity Form release includes new product information management features, letting you duplicate product variations for faster product data entry. Thanks to generous sponsorship from Authorize.Net themselves, we've been able to dedicate several weeks to improving their integration this year. The resulting Authorize.Net RC1 release now supports eCheck, Visa Checkout, and 3DSecure payments! We also included several bug fixes related to duplicate customer and payment profiles that appear when migrating from an old system to Drupal Commerce, for example. While not fully released yet, our Technology Partner integration for Avalara's AvaTax is nearing beta. Jace Bennest from Acro Media contributed heavily by refactoring the module to properly use a TaxType plugin while my co-maintainer Matt Glaman contributed additional fixes to our port from the Drupal 7 integration to prepare it for certification. Thanks, Jace / Acro Media! We've also been hard at work improving the evaluator experience. 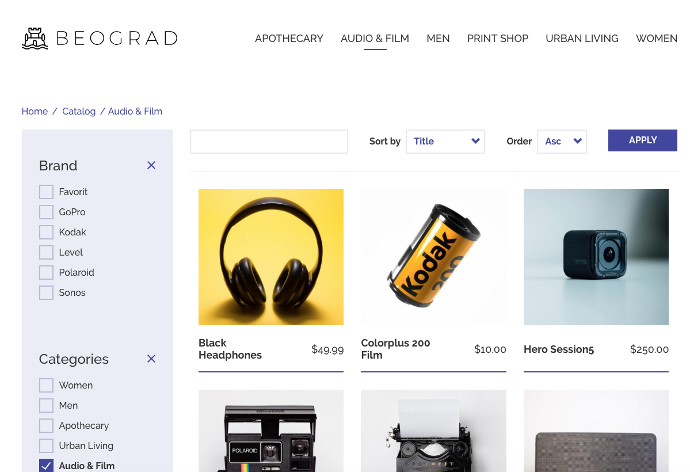 The big release for that is Commerce Demo's beta1, which showcases what Drupal Commerce provides out of the box. It creates products and scaffolds out a full product catalog (pictured below). To get the full effect, try it out with our default store theme, Belgrade. The new demo module gets us closer to something like we had with Kickstart 2.x on Drupal 7 - a learning resource for site builders and a way for agencies to more easily demo and sell Drupal Commerce. Finally, I'm very excited to announce that Lisa Streeter is our new documentation lead! Expect some great things to come. She has already done fantastic work with the Commerce Recurring documentation and is working on revising our getting started, installation, and update docs. Looking at June, we plan on finalizing the query level entity access API, which will allow us to better support marketplace and multi-store Drupal Commerce implementations. We expect to merge user registration after checkout completion, and we will also be focusing on address reuse / copying, Buy One Get One promotion offers, and more product management experience enhancements. Now that 2017 is over and we’re back from our well deserved holidays, it’s time to look at what the Drupal Commerce community accomplished over the past year. There is no doubt that Drupal Commerce is one of the largest and most active projects in the Drupal community. The #commerce channel is now the most active channel on the Drupal Slack, with 550 members. Over a hundred modules have received contributions from several hundred contributors working for dozens of different agencies. Just a few months after the initial stable release, there are over 2000 reported installations with new case studies appearing every week! Eight months ago we launched the first beta version of Commerce 2.x for Drupal 8. Since then we’ve made 304 code commits by 58 contributors, and we've seen dozens of attractive, high-performing sites go live. We entered the release candidate phase this month with the packaging of Commerce 2.0-rc1 (release notes), the final part of our long and fruitful journey to a full 2.0. Some of the most exciting updates this Summer center around our promotions system. This work represents a huge leap forward from Commerce 1.x, as we've made promotions first class citizens in core. They power a variety of discount types and coupons, and now that they are in core we can ensure the systems are designed to look and work well on both the front end and back end. The average Drupal Commerce site depends on many external PHP libraries. Address needs commerceguys/addressing and Commerce needs commerceguys/intl. GeoIP needs geoip2/geoip2 and Search API Solr needs solarium/solarium. Each payment gateway needs a matching SDK. These libraries must be downloaded separately, because license constraints prevent us from committing their code to drupal.org itself. For the past 5 years, the primary and only way to download and use PHP libraries has been Composer, a command line tool. Composer works per-project, meaning each Drupal install has one folder for all PHP libraries it requires, regardless of which module needs which. This allows Composer to detect and prevent conflicts such as incompatible library versions. Composer also recursively resolves dependencies, automatically installing and updating packages required by other packages. This is a major benefit to Drupal site administrators compared to previous tools like Drush Make. However, Drupal's reliance on the Composer-generated autoloader makes it impossible to upload manually downloaded libraries, making Composer non-optional. During the Commerce 2.x session at DrupalCon Dublin we officially tagged Drupal Commerce 2.0-beta1, our first production ready release. This does not mean it is feature complete or bug-free, but it does mean that from this point on, we support updating between 2.x releases - a key requirement for production usage. Start a Drupal 8 eCommerce site today, and you will be able to update your way to the full 2.0 release and beyond. Photo credit Will Jackson during the "Launching online stores with Commerce 2.x on Drupal 8" session. 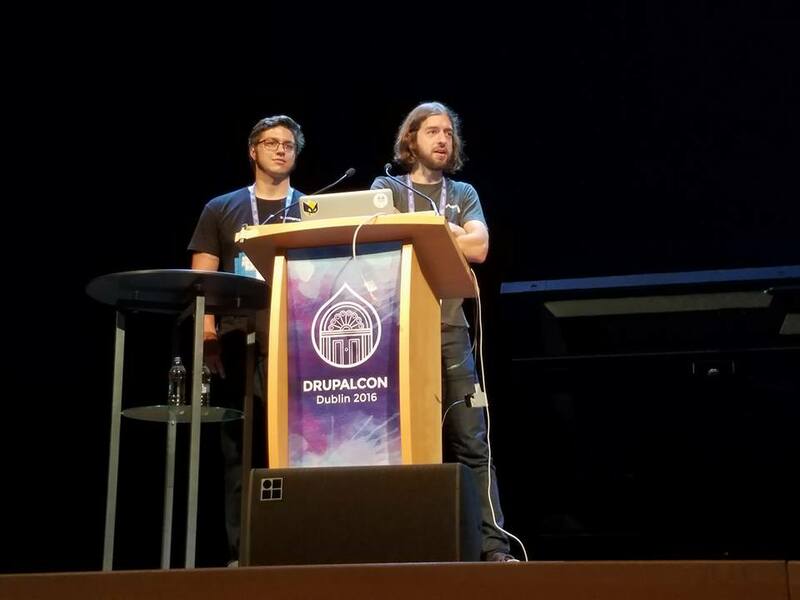 For a quick overview of our project philosophy and the improvements we've included in Commerce 2.x, watch our session from DrupalCon Dublin. The session heavily features the Sport Obermeyer case study, one of the first major eCommerce projects built on Drupal 8 by Bluespark and Commerce Guys. Their project influenced and shaped Commerce 2.x development in a big way, validating our ideas and providing solid use cases for features like fancy attributes, promotions, coupons, and more. Additionally, we helped build the project as a single site serving three unique customer personas with a different purchasing workflow for each one. That drove development on our add to cart and checkout flow APIs, ensuring they have the needed flexibility to allow parallel implementations from day one. In addition to the case study linked above, check out Matt Glaman's interview with Bluespark for more information. So... what has changed since alpha4? Commerce 2.x: Unit, Kernel, and Functional Tests Oh My! At the end of May, I made an initiative to move all of the Drupal Commerce tests away from Simpletest and to use the available test classes built off of PHPUnit. Why? Simpletest is a test framework within Drupal and not used by the PHP community at large. 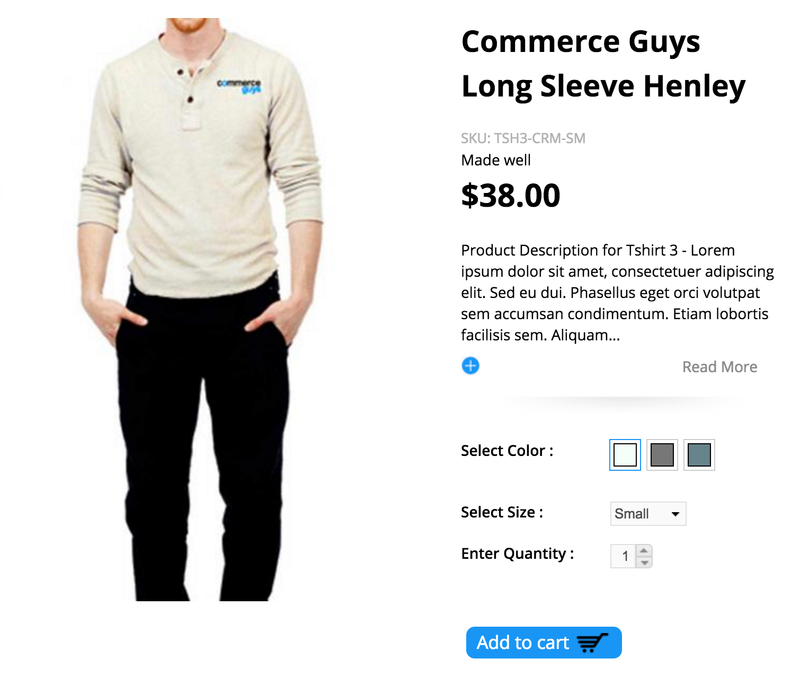 In Drupal Commerce 1.x, we used the Commerce Fancy Attributes and Field Extractor modules to render attributes more dynamically than just using simple select lists. This let you do things like show a color swatch instead of just a color name for a customer to select. Fancy Attributes on a product display in Commerce Kickstart 2.x. 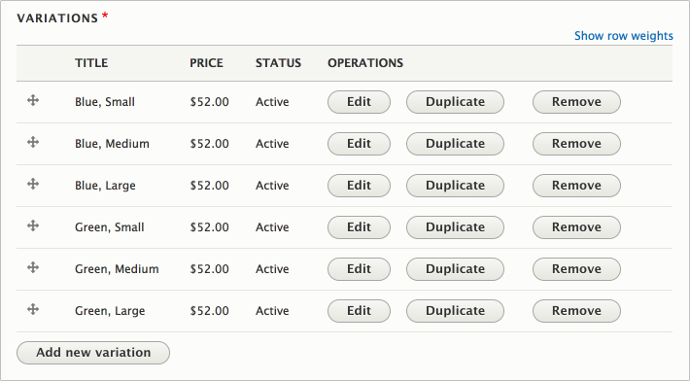 In Commerce 2.0-alpha4, we introduced specific product attribute related entity types. Building on top of them and other contributed modules, we can now provide fancy attributes out of the box! When presenting the attribute dropdown, we show the labels of attribute values. But since attribute values are fieldable, we can just as easily use a different field to represent it, such as an image or a color field. To accomplish this, we provide a new element type that renders the attribute value entities as a radio button option. Read more to see an example configuration.